Welcome to Outlander Man Comix! One day a man named Bob went onto his roof in the middle of a rainstorm to fix his satellite connection. Suddenly, he was struck by a bolt of "stupelectrid lightning"* and received horribly unhelpful powers! Now, with the help of the Beer Cats, Bob must protect Beeravia from outside (and inside) threats. Can he do it? Or are his powers just too outlandish. . . ? Find out in the exciting, mind-blowing, wacky comic strip that is Outlander Man! *Stupelectrid lightning: A type of lightning that is attracted to stupidity. Extremely rare; side effects unknown. Click the image above to see the latest Outlander Man strip! 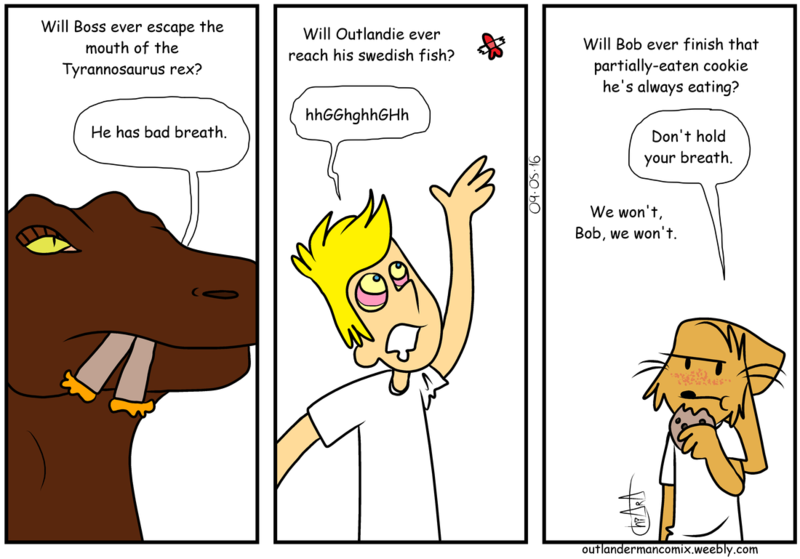 Hooray, Outlandie was saved by a kite, but sort of kind of found out he has a secret weakness for swedish fish. Oops. But no worries, because Boss taped a swedish fish to the ceiling, and that should keep Outlandie occupied for a while yet. Meanwhile, it's a PAR-TAY in the Beer Cave for the Beer Cats! And then someone crashes it. Experience Outlander Man's epic adventures first hand by reading the Outlander Man comic strip! Updates daily. Click this button to jump to the first page of Outlander Man comics. A quick way to find Outlander Man #1: Bob Needs His Satellite Fixed. This button will take you to the Outlander Man strip archives, which are organized by storyline. There's still a lot of work in progress going on for them, but most of the more recent storyline archives are all available! 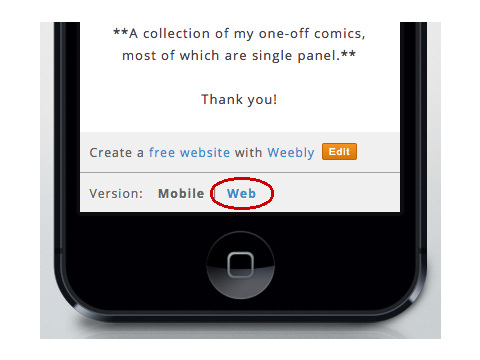 IMPORTANT: This site's design gets really screwed up on mobile devices. For best navigation and viewing results, please use your computer, or tap the Web version option on your mobile device, as shown below. Thanks! Note: If you're having trouble reading my comics, magnify the contents of your browser window by hitting Command >> + on Macs. If you have a different brand of computer, you might want to make an Internet search on zooming in on the text and images inside a browser page on your type of computer. Thanks! Read Lovers in League and meet Woo, the passionate young woman with a love of cat and chicken hats, corn dogs, and ticking people off. Also check out my other comic strip, Jump Rope, a collection of my one-off comics, most of which are single panel. While this is no longer updated, there's nothing stopping you from enjoying some old JRs! Click away!